A digital divide is any uneven distribution in the access to, use of, or impact of information and communication technologies (ICT) between any number of distinct groups; these groups may be defined based on social, geographical, or geopolitical criteria, or otherwise. The divide within countries (such as the digital divide in the United States) may refer to inequalities between individuals, households, businesses, or geographic areas, usually at different socioeconomic levels or other demographic categories. The divide between differing countries or regions of the world is referred to as the global digital divide, examining this technological gap between developing and developed countries on an international scale. To what does the subject connect: fixed or mobile, Internet or telephone, digital TV, broadband, etc. Different authors focus on different aspects, which leads to a large variety of definitions of the digital divide. "For example, counting with only 3 different choices of subjects (individuals, organizations, or countries), each with 4 characteristics (age, wealth, geography, sector), distinguishing between 3 levels of digital adoption (access, actual usage and effective adoption), and 6 types of technologies (fixed phone, mobile... Internet...), already results in 3x4x3x6 = 216 different ways to define the digital divide. Each one of them seems equally reasonable and depends on the objective pursued by the analyst". The "digital divide" is also referred to by a variety of other terms which have similar meanings, though may have a slightly different emphasis: digital inclusion, digital participation, basic digital skills, media literacy  and digital accessibility. The National Digital Inclusion Alliance, a US-based nonprofit organization, has found the term "digital divide" to be problematic, since there are a multiplicity of divides. Instead, they chosen to use the term "digital inclusion", providing a definition: Digital Inclusion refers to the activities necessary to ensure that all individuals and communities, including the most disadvantaged, have access to and use of Information and Communication Technologies (ICTs). This includes 5 elements: 1) affordable, robust broadband internet service; 2) internet-enabled devices that meet the needs of the user; 3) access to digital literacy training; 4) quality technical support; and 5) applications and online content designed to enable and encourage self-sufficiency, participation and collaboration. The infrastructure by which individuals, households, businesses, and communities connect to the Internet address the physical mediums that people use to connect to the Internet such as desktop computers, laptops, basic mobile phones or smartphones, iPods or other MP3 players, gaming consoles such as Xbox or PlayStation, electronic book readers, and tablets such as iPads. Traditionally the nature of the divide has been measured in terms of the existing numbers of subscriptions and digital devices. Given the increasing number of such devices, some have concluded that the digital divide among individuals has increasingly been closing as the result of a natural and almost automatic process. Others point to persistent lower levels of connectivity among women, racial and ethnic minorities, people with lower incomes, rural residents, and less educated people as evidence that addressing inequalities in access to and use of the medium will require much more than the passing of time. Recent studies have measured the digital divide not in terms of technological devices, but in terms of the existing bandwidth per individual (in kbit/s per capita). As shown in the Figure on the side, the digital divide in kbit/s is not monotonically decreasing, but re-opens up with each new innovation. For example, "the massive diffusion of narrow-band Internet and mobile phones during the late 1990s" increased digital inequality, as well as "the initial introduction of broadband DSL and cable modems during 2003–2004 increased levels of inequality". This is because a new kind of connectivity is never introduced instantaneously and uniformly to society as a whole at once, but diffuses slowly through social networks. As shown by the Figure, during the mid-2000s, communication capacity was more unequally distributed than during the late 1980s, when only fixed-line phones existed. The most recent increase in digital equality stems from the massive diffusion of the latest digital innovations (i.e. fixed and mobile broadband infrastructures, e.g. 3G and fiber optics FTTH). Measurement methodologies of the digital divide, and more specifically an Integrated Iterative Approach General Framework (Integrated Contextual Iterative Approach – ICI) and the digital divide modeling theory under measurement model DDG (Digital Divide Gap) are used to analyze the gap existing between developed and developing countries, and the gap among the 27 members-states of the European Union. Instead of tracking various kinds of digital divides among fixed and mobile phones, narrow- and broadband Internet, digital TV, etc., it has recently been suggested to simply measure the amount of kbit/s per actor. This approach has shown that the digital divide in kbit/s per capita is actually widening in relative terms: "While the average inhabitant of the developed world counted with some 40 kbit/s more than the average member of the information society in developing countries in 2001, this gap grew to over 3 Mbit/s per capita in 2010." The upper graph of the Figure on the side shows that the divide between developed and developing countries has been diminishing when measured in terms of subscriptions per capita. In 2001, fixed-line telecommunication penetration reached 70% of society in developed OECD countries and 10% of the developing world. This resulted in a ratio of 7 to 1 (divide in relative terms) or a difference of 60% (divide in measured in absolute terms). 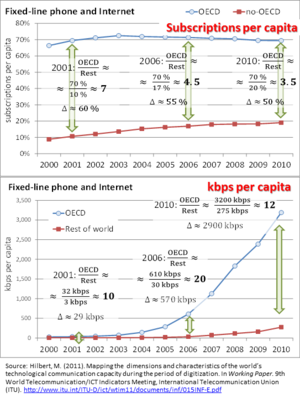 During the next decade, fixed-line penetration stayed almost constant in OECD countries (at 70%), while the rest of the world started a catch-up, closing the divide to a ratio of 3.5 to 1. The lower graph shows the divide not in terms of ICT devices, but in terms of kbit/s per inhabitant. While the average member of developed countries counted with 29 kbit/s more than a person in developing countries in 2001, this difference got multiplied by a factor of one thousand (to a difference of 2900 kbit/s). 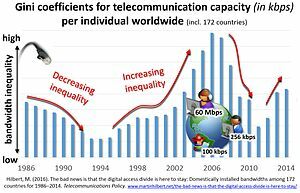 In relative terms, the fixed-line capacity divide was even worse during the introduction of broadband Internet at the middle of the first decade of the 2000s, when the OECD counted with 20 times more capacity per capita than the rest of the world. This shows the importance of measuring the divide in terms of kbit/s, and not merely to count devices. The International Telecommunications Union concludes that "the bit becomes a unifying variable enabling comparisons and aggregations across different kinds of communication technologies". The gap in a digital divide may exist for a number of reasons. Obtaining access to ICTs and using them actively has been linked to a number of demographic and socio-economic characteristics: among them income, education, race, gender, geographic location (urban-rural), age, skills, awareness, political, cultural and psychological attitudes. Multiple regression analysis across countries has shown that income levels and educational attainment are identified as providing the most powerful explanatory variables for ICT access and usage. Evidence was found that Caucasians are much more likely than non-Caucasians to own a computer as well as have access to the Internet in their homes. As for geographic location, people living in urban centers have more access and show more usage of computer services than those in rural areas. Gender was previously thought to provide an explanation for the digital divide, many thinking ICT were male gendered, but controlled statistical analysis has shown that income, education and employment act as confounding variables and that women with the same level of income, education and employment actually embrace ICT more than men (see Women and ICT4D). However, each nation has its own set of causes or the digital divide. For example, the digital divide in Germany is unique because it is not largely due to difference in quality of infrastructure. One telling fact is that "as income rises so does Internet use ...", strongly suggesting that the digital divide persists at least in part due to income disparities. Most commonly, a digital divide stems from poverty and the economic barriers that limit resources and prevent people from obtaining or otherwise using newer technologies. The Facebook Divide, a concept derived from the "digital divide", is the phenomenon with regard to access to, use of, or impact of Facebook on individual society and among societies. It is suggested at the International Conference on Management Practices for the New Economy (ICMAPRANE-17) on February 10–11, 2017. Additional concepts of Facebook Native and Facebook Immigrants are suggested at the conference. The Facebook Divide, Facebook native, Facebook immigrants, and Facebook left-behind are concepts for social and business management research. Facebook Immigrants are utilizing Facebook for their accumulation of both bonding and bridging social capital. These Facebook Native, Facebook Immigrants, and Facebook left-behind induced the situation of Facebook inequality. In February 2018, the Facebook Divide Index was introduced at the ICMAPRANE conference in Noida, India, to illustrate the Facebook Divide phenomenon. In the United States, research provided by Sungard Availability Services notes a direct correlation between a company's access to technological advancements and its overall success in bolstering the economy. The study, which includes over 2,000 IT executives and staff officers, indicates that 69 percent of employees feel they do not have access to sufficient technology in order to make their jobs easier, while 63 percent of them believe the lack of technological mechanisms hinders their ability to develop new work skills. Additional analysis provides more evidence to show how the digital divide also affects the economy in places all over the world. A BCG Report suggests that in countries like Sweden, Switzerland, and the U.K., the digital connection among communities is made easier, allowing for their populations to obtain a much larger share of the economies via digital business. In fact, in these places, populations hold shares approximately 2.5 percentage points higher. During a meeting with the United Nations a Bangladesh representative expressed his concern that poor and undeveloped countries would be left behind due to a lack of funds to bridge the digital gap. The digital divide also impacts children's ability to learn and grow in low-income school districts. Without Internet access, students are unable to cultivate necessary tech skills in order to understand today's dynamic economy. Federal Communication Commission's Broadband Task Force created a report showing that about 70% of teachers give students homework that demand access to broadband. Even more, approximately 65% of young scholars use the Internet at home to complete assignments as well as connect with teachers and other students via discussion boards and shared files. A recent study indicates that practically 50% of students say that they are unable to finish their homework due to an inability to either connect to the Internet, or in some cases, find a computer. This has led to a new revelation: 42% of students say they received a lower grade because of this disadvantage. Finally, according to research conducted by the Center for American Progress, "if the United States were able to close the educational achievement gaps between native-born white children and black and Hispanic children, the U.S. economy would be 5.8 percent—or nearly $2.3 trillion—larger in 2050". Furthermore, according to the 2012 Pew Report "Digital Differences", a mere 62% of households who make less than $30,000 a year use the Internet, while 90% of those making between $50,000 and $75,000 had access. Studies also show that only 51% of Hispanics and 49% of African Americans have high-speed Internet at home. This is compared to the 66% of Caucasians that too have high-speed Internet in their households. Overall, 10% of all Americans don't have access to high-speed Internet, an equivalent of almost 34 million people. Supplemented reports from the Guardian demonstrate the global effects of limiting technological developments in poorer nations, rather than simply the effects in the United States. Their study shows that the rapid digital expansion excludes those who find themselves in the lower class. 60% of the world's population, almost 4 billion people, have no access to the Internet and are thus left worse off. Since gender, age, racial, income, and educational digital divides have lessened compared to the past, some researchers suggest that the digital divide is shifting from a gap in access and connectivity to ICTs to a knowledge divide. A knowledge divide concerning technology presents the possibility that the gap has moved beyond access and having the resources to connect to ICTs to interpreting and understanding information presented once connected. The second-level digital divide also referred to as the production gap, describes the gap that separates the consumers of content on the Internet from the producers of content. As the technological digital divide is decreasing between those with access to the Internet and those without, the meaning of the term digital divide is evolving. Previously, digital divide research has focused on accessibility to the Internet and Internet consumption. However, with more and more of the population gaining access to the Internet, researchers are examining how people use the Internet to create content and what impact socioeconomics are having on user behavior. New applications have made it possible for anyone with a computer and an Internet connection to be a creator of content, yet the majority of user-generated content available widely on the Internet, like public blogs, is created by a small portion of the Internet using population. Web 2.0 technologies like Facebook, YouTube, Twitter, and Blogs enable users to participate online and create content without having to understand how the technology actually works, leading to an ever-increasing digital divide between those who have the skills and understanding to interact more fully with the technology and those who are passive consumers of it. Many are only nominal content creators through the use of Web 2.0, posting photos and status updates on Facebook, but not truly interacting with the technology. Internet users in 2015 as a percentage of a country's populationSource: International Telecommunications Union. Empirical tests have identified that several socio-demographic characteristics foster or limit ICT access and usage. Among different countries, educational levels and income are the most powerful explanatory variables, with age being a third one. While a Global Gender Gap in access and usage of ICT's exist, empirical evidence show that this due to unfavorable conditions with respect to employment, education and income and not to technophobia or lower ability. In the contexts under study, women with the prerequsites for access and usage turned out to be more active users of digital tools than men. Guillen & Suarez argue that "democratic political regimes enable a faster growth of the Internet than authoritarian or totalitarian regimes". :687 The Internet is considered a form of e-democracy and attempting to control what citizens can or cannot view is in contradiction to this. Recently situations in Iran and China have denied people the ability to access certain websites and disseminate information. Iran has prohibited the use of high-speed Internet in the country and has removed many satellite dishes in order to prevent the influence of Western culture, such as music and television. Many experts claim that bridging the digital divide is not sufficient and that the images and language needed to be conveyed in a language and images that can be read across different cultural lines. A 2013 study conducted by Pew Research Center noted how participants taking the survey in Spanish were nearly twice as likely to not use the internet. Social mobility – Computer and Internet use is regarded as being very important to development and success. However, some children are not getting as much technical education as others, because lower socioeconomic areas cannot afford to provide schools with computer facilities. For this reason, some kids are being separated and not receiving the same chance as others to be successful. Free Basics is a partnership between social networking services company Facebook and six companies (Samsung, Ericsson, MediaTek, Opera Software, Nokia and Qualcomm) that plans to bring affordable access to selected Internet services to less developed countries by increasing efficiency, and facilitating the development of new business models around the provision of Internet access. In the whitepaper realised by Facebook's founder and CEO Mark Zuckerberg, connectivity is asserted as a "human right", and Internet.org is created to improve Internet access for people around the world. "Free Basics provides people with access to useful services on their mobile phones in markets where internet access may be less affordable. The websites are available for free without data charges, and include content about news, employment, health, education and local information etc. By introducing people to the benefits of the internet through these websites, we hope to bring more people online and help improve their lives." However, Free Basics is also accused of violating net neutrality for limiting access to handpicked services. Despite a wide deployment in numerous countries, it has been met with heavy resistance notably in India where the Telecom Regulatory Authority of India eventually banned it in 2016. Several projects to bring internet to the entire world with a satellite constellation have been devised in the last decade, one of these being Starlink by Elon Musk's company SpaceX. Unlike Free Basics, it would provide people with a full internet access and would not be limited to a few selected services. In the same week Starlink was announced, serial-entrepreneur Richard Branson announced his own project OneWeb, a similar constellation with approximately 700 satellites that has already procured communication frequency licenses for their broadcast spectrum and could possibly be operational as early as in 2019. The biggest hurdle of these projects is the astronomical financial and logistical costs of launching so many satellites. After the failure of previous satellite-to-consumer space ventures, satellite industry consultant Roger Rusch said "It's highly unlikely that you can make a successful business out of this." Musk has publicly acknowledged this business reality, and indicated in mid-2015 that while endeavoring to develop this technically-complicated space-based communication system he wants to avoid overextending the company and stated that they are being measured in the pace of development. One Laptop per Child (OLPC) is another attempt to narrow the digital divide. This organization, founded in 2005, provides inexpensively produced "XO" laptops (dubbed the "$100 laptop", though actual production costs vary) to children residing in poor and isolated regions within developing countries. Each laptop belongs to an individual child and provides a gateway to digital learning and Internet access. The XO laptops are designed to withstand more abuse than higher-end machines, and they contain features in context to the unique conditions that remote villages present. Each laptop is constructed to use as little power as possible, have a sunlight-readable screen, and is capable of automatically networking with other XO laptops in order to access the Internet—as many as 500 machines can share a single point of access. ^ a b U.S. Department of Commerce, National Telecommunications and Information Administration (NTIA). (1995). Falling through the net: A survey of the have nots in rural and urban America. Retrieved from, http://www.ntia.doc.gov/ntiahome/fallingthru.html. ^ Norris, P. (2001). Digital Divide: Civic Engagement, Information Poverty and the Internet Worldwide Archived October 24, 2009, at the Wayback Machine. Cambridge University Press. ^ a b c d e Hilbert, Martin (2013). "Technological information inequality as an incessantly moving target: The redistribution of information and communication capacities between 1986 and 2010" (PDF). Journal of the Association for Information Science and Technology. 65 (4): 821–835. doi:10.1002/asi.23020. ^ a b Eszter Hargittai. The Digital Divide and What to Do About It. New Economy Handbook, p. 824, 2003. ^ a b Blau, A (2002). "Access isn't enough: Merely connecting people and computers won't close the digital divide". American Libraries. 33 (6): 50–52. ^ a b Graham, Mark (2014). "The Knowledge Based Economy and Digital Divisions of Labour". Pages 189-195 in Companion to Development Studies, 3rd edition, V. Desai, and R. Potter (eds). Routledge, Taylor & Francis Group. ISBN 978-1-44-416724-5 (paperback). ISBN 978-0-415-82665-5 (hardcover). ^ a b c d e Hilbert, Martin (2011). "The end justifies the definition: The manifold outlooks on the digital divide and their practical usefulness for policy-making" (PDF). Telecommunications Policy. 35 (8): 715–736. doi:10.1016/j.telpol.2011.06.012. ^ "Digital Divide and Global Inequalities in Education"
^ "Dashboard - Digital inclusion". GOV.UK. Retrieved October 26, 2018. ^ "Tech Partnership Legacy". Thetechpartnership.com. Retrieved October 26, 2018. ^ "Media literacy". Ofcom. Retrieved October 26, 2018. ^ Rouse, Margaret. "What is digital accessibility? - Definition from WhatIs.com". Whatis.techtarget.com. Retrieved October 26, 2018. ^ "NDIA". 2017. Retrieved June 25, 2018. ^ Zickuher, Kathryn. 2011. Generations and their gadgets. Pew Internet & American Life Project. ^ a b c d e f Hilbert, Martin (2016). "The bad news is that the digital access divide is here to stay: Domestically installed bandwidths among 172 countries for 1986–2014". Telecommunications Policy. 40 (6). ^ Dutton, W.H. ; Gillett, S.E. ; McKnight, L.W. ; Peltu, M. (2004). "Bridging broadband internet divides". Journal of Information Technology. 19 (1): 28–38. doi:10.1057/palgrave.jit.2000007. ^ Kathryn zickuhr. Who's not online and why? Pew Research Center, 2013. ^ Abdalhakim, Hawaf., (2009). An innovated objective digital divide measure, Journal of Communication and Computer, Volume 6, No.12 (Serial No.61), USA. ^ Figures 11 and 12 in "Mapping the dimensions and characteristics of the world’s technological communication capacity during the period of digitization (1986–2007/2010)". Hilbert, Martin. Working paper INF/15-E, International Telecommunications Union. December 2, 2011. ^ Hilbert, Martin (2010). "Information Societies or "ICT Equipment Societies?" Measuring the Digital Information-Processing Capacity of a Society in Bits and Bytes". The Information Society. 26 (3): 157–178. doi:10.1080/01972241003712199. ^ "Chapter 5: Measuring communication capacity in bits and bytes", in Measuring the report Information Society 2012; ITU (International Telecommunication Union) (2012). ^ Mun-cho, K. & Jong-Kil, K. (2001). Digital divide: conceptual discussions and prospect, In W. Kim, T. Wang Ling, Y.j. Lee & S.S. Park (Eds. ), The human society and the Internet: Internet related socio-economic Issues, First International Conference, Seoul, Korea: Proceedings, Springer, New York, NY. ^ Aqili, S.; Moghaddam, A. (2008). "Bridging the digital divide: The role of librarians and information professionals in the third millennium". Electronic Library. 26 (2): 226–237. doi:10.1108/02640470810864118. ^ Ramalingam A, Kar SS (2014). "Is there a digital divide among school students? an exploratory study from Puducherry". J Educ Health Promot. 3: 30. doi:10.4103/2277-9531.131894 (inactive September 23, 2018). PMC 4089106. PMID 25013823. ^ Ryan Kim (October 25, 2011). "'App gap' emerges highlighting savvy mobile children". GigaOM. ^ a b c Mossberger, Karen; Tolbert, Carolina J.; Gilbert, Michele (2006). "Race, Place, and Information Technology (IT)". Urban Affairs Review. 41 (5): 583–620. doi:10.1177/1078087405283511. ^ Lawton, Tait. "15 Years of Chinese Internet Usage in 13 Pretty Graphs". NanjingMarketingGroup.com. CNNIC. Archived from the original on April 22, 2014. ^ a b c Guillen, M. F.; Suárez, S. L. (2005). "Explaining the global digital divide: Economic, political and sociological drivers of cross-national internet use". Social Forces. 84 (2): 681–708. CiteSeerX 10.1.1.649.2813. doi:10.1353/sof.2006.0015. ^ a b c Wilson, III. E.J. (2004). The Information Revolution and Developing Countries. Cambridge, Massachusetts: The MIT Press. ^ a b Carr, Deborah (2007). "The Global Digital Divide". Contexts. 6 (3): 58. doi:10.1525/ctx.2007.6.3.58. ^ a b c d e Hilbert, Martin (2010). "When is Cheap, Cheap Enough to Bridge the Digital Divide? Modeling Income Related Structural Challenges of Technology Diffusion in Latin America" (PDF). World Development. 38 (5): 756–770. doi:10.1016/j.worlddev.2009.11.019. ^ a b Hilbert, Martin (November – December 2011). "Digital gender divide or technologically empowered women in developing countries? A typical case of lies, damned lies, and statistics" (PDF). Women's Studies International Forum. 34 (6): 479–489. doi:10.1016/j.wsif.2011.07.001. ^ Schliefe, Katrin (February 2007). "Regional Versus. Individual Aspects of the Digital Divide in Germany" (PDF). Retrieved October 21, 2017. ^ Rubin, R.E. (2010). Foundations of library and information science. 178-179. New York: Neal-Schuman Publishers. ^ Yung, Chunsing (June 1, 2017). "From Digital Divide to Facebook Divide, Reconstruct our Target Market Segments with Facebook Native and Facebook Immigrant". Jaipuria International Journal of Management Research. 3 (1): 8–18. doi:10.22552/jijmr/2017/v3/i1/146083. ISSN 2454-9509. ^ Thakur, Rajiv; Srivastava, Vinita; Bhatia, Shikha; Sharma, Jitender (2017). Management Practices for the New Economy. India: Bloomsbury Publishing India Pvt. Ltd. pp. 53–56. ISBN 9789386432087. ^ Yung, Chun Sing (June 23, 2017). "Facebook Divide Society [面簿分隔的社會]". Zao Bao, Singapore, Page 22. ^ "Past Conference – ICMAPRANE2018". Jaipuria.ac.in. February 11, 2017. Retrieved October 26, 2018. ^ "ICMAPRANE 2018". Jaipuria.ac.in. June 20, 2014. Retrieved October 26, 2018. ^ Acevedo, Manuel. 2005. Volunteering in the information society, Research paper. ^ Greyling, E.; Zulu, S. (2010). "Content development in an indigenous digital library: A case study in community participation". IFLA Journal. 36 (1): 30–9. doi:10.1177/0340035209359570. ^ Pingo, Z. B. (2015). Transition from Camel Libraries to Digital Technologies in Kenya Public Libraries. Public Library Quarterly, 34(1), 63-84. ^ Gurstein, Michael. "Effective use: A community informatics strategy beyond the digital divide". Archived from the original on March 9, 2012. Retrieved June 12, 2012. ^ Gurstein, Michael. "Open data: Empowering the empowered or effective data use for everyone?". Archived from the original on November 24, 2012. Retrieved June 12, 2012. ^ a b McKendrick, Joe. "Lack Of Digital, Cloud Opportunities Is Actually Embarrassing For Employees, Survey Suggests". Forbes. Retrieved April 17, 2017. ^ a b Foroohar, Rana. "The Real Threat to Economic Growth Is the Digital Divide". Time. ISSN 0040-781X. Retrieved April 17, 2017. ^ "Closing Digital Divide Critical to Social, Economic Development, Delegates Say at Second Committee Debate on Information and Communications Technologies | Meetings Coverage and Press Releases". www.un.org. Retrieved September 26, 2017. ^ a b c "Digital Divide: The Technology Gap between the Rich and Poor". Digital Responsibility. Retrieved April 17, 2017. ^ a b c d "The Homework Gap: The 'Cruelest Part of the Digital Divide'". NEA Today. April 20, 2016. Retrieved April 17, 2017. ^ "The Digital Divide in the Age of the Connected Classroom | NetRef". NetRef. January 14, 2016. Retrieved April 17, 2017. ^ Kang, Cecilia (June 7, 2016). "The Challenges of Closing the Digital Divide". The New York Times. ISSN 0362-4331. Retrieved April 17, 2017. ^ Elliott, Larry (January 13, 2016). "Spread of internet has not conquered 'digital divide' between rich and poor – report". The Guardian. ISSN 0261-3077. Retrieved April 17, 2017. ^ a b Graham, M. (July 2011). "Time machines and virtual portals: The spatialities of the digital divide". Progress in Development Studies. 11 (3): 211–227. CiteSeerX 10.1.1.659.9379. doi:10.1177/146499341001100303. ^ Sciadas, George. (2003). Monitoring the Digital Divide…and Beyond. Orbicom. ^ Correa, Teresa. (2008) Literature Review: Understanding the "second-level digital divide" papers by Teresa Correa. Unpublished manuscript, School of Journalism, College of Communication, University of Texas at Austin. .
^ a b Schradie, Jen (2011). "The Digital Production Gap: The Digital Divide and Web 2.0 Collide" (PDF). Poetics. 39 (2): 145–168. doi:10.1016/j.poetic.2011.02.003. Archived from the original (PDF) on February 27, 2012. ^ a b Reinhart, J.; Thomas, E.; Toriskie, J. (2011). "K-12 Teachers: Technology Use and the Second Level Digital Divide". Journal of Instructional Psychology. 38 (3/4): 181. ^ "Individuals using the Internet 2005 to 2014", Key ICT indicators for developed and developing countries and the world (totals and penetration rates), International Telecommunication Union (ITU). Retrieved May 25, 2015. ^ "Internet users per 100 inhabitants 1997 to 2007", ICT Data and Statistics (IDS), International Telecommunication Union (ITU). Retrieved May 25, 2015. ^ "Total Midyear Population for the World: 1950-2050"". International Programs Center for Demographic and Economic Studies, U.S. Census Bureau. Archived from the original on April 17, 2017. Retrieved October 7, 2018. ^ "ICT Facts and Figures 2005, 2010, 2017". Telecommunication Development Bureau, International Telecommunication Union (ITU). Retrieved October 7, 2018. ^ "Active mobile-broadband subscriptions per 100 inhabitants 2012", Dynamic Report, ITU ITC EYE, International Telecommunication Union. Retrieved on June 29, 2013. ^ "ICT Facts and Figures 2005, 2010, 2016". Telecommunication Development Bureau, International Telecommunication Union (ITU). Retrieved May 24, 2015. ^ Lu, Ming-te (2001). "Digital divide in developing countries" (PDF). Journal of Global Information Technology Management. 4 (3): 1–4. doi:10.1080/1097198x.2001.10856304. Archived from the original (PDF) on August 26, 2014. ^ Krueger 1993; Attewell and Battle 1999. ^ “Digital Divide.” The Digital Divide, Stanford University, cs.stanford.edu/people/eroberts/cs201/projects/digital-divide/start.html. Retrieved September 19, 2017. ^ Section 508 Archived August 6, 2013, at the Wayback Machine (1998). United States Government. ^ Tait, Robert (July 23, 2006). "Iran bans fast internet to cut west's influence". The Guardian. London. Retrieved March 11, 2017. ^ "Who's Not Online and Why". Pew Research Center: Internet, Science & Tech. September 25, 2013. Retrieved February 4, 2018. ^ Social Impact Open Repository (2011). "Inclusion of excluded groups in decision-making in the development of technologies". SIOR. Archived from the original on September 5, 2017. ^ James, J (2008). "Digital Divide Complacency: Misconceptions and Dangers". The Information Society. 24: 54–61. doi:10.1080/01972240701774790. ^ a b c Pick, J.; Azari, R. (2008). "Global Digital Divide: Influence of Socioeconomic, Governmental, and Accessibility Factors on Information Technology". Information Technology for Development. 14 (2): 91–115. doi:10.1002/itdj.20095. ^ Rahman, H. (2006). Empowering Marginal Communities and Information Networking. Hershey, Pennsylvania: Idea Group Publishing. ^ a b c d e Ali, Amir (2011). "The Power of Social Media in Developing Nations: New Tools for Closing the Global Digital Divide and Beyond" (PDF). Harvard Human Rights Journal. 24: 1. ^ "Elon Musk and Richard Branson invest in satellite-Internet ventures". ^ a b One Laptop Per Child. (2009). Borland, J. (April 13, 1998). "Move Over Megamalls, Cyberspace Is the Great Retailing Equalizer". Knight Ridder/Tribune Business News. Brynjolfsson, Erik and Michael D. Smith (2000). "The great equalizer? Consumer choice behavior at Internet shopbots". Sloan Working Paper 4208-01. eBusiness@MIT Working Paper 137. July 2000. Sloan School of Management, Massachusetts Institute of Technology, Cambridge, Massachusetts. "São Paulo Special: Bridging Brazil's digital divide", Digital Planet, BBC World Service, October 2, 2008. Graham, M (2011). "Time Machines and Virtual Portals: The Spatialities of the Digital Divide". Progress in Development Studies. 11 (3): 211–227. CiteSeerX 10.1.1.659.9379. doi:10.1177/146499341001100303. Yfantis, V. (2017). "Disadvantaged Populations And Technology In Music". A book about the digital divide in the music industry.